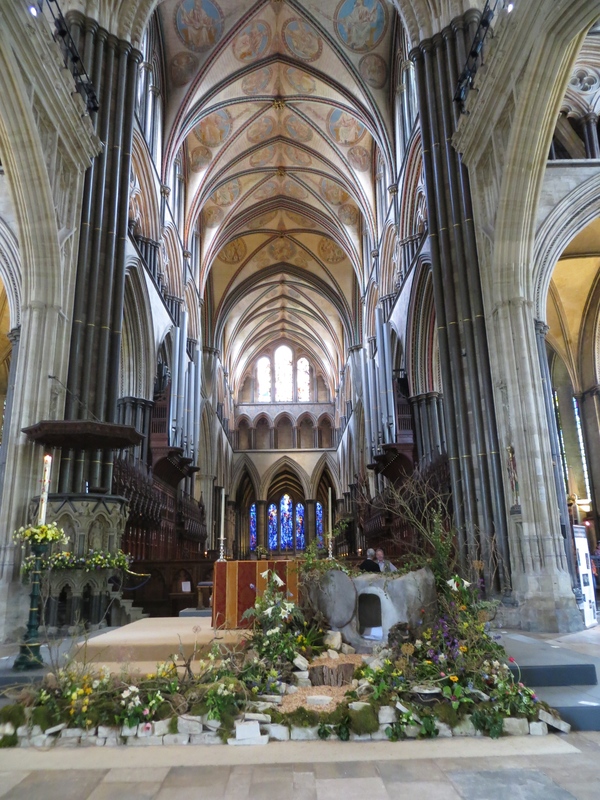 Salisbury Cathedral is one of the great British Anglican cathedrals, predating the Reformation but still in use, still magnificent, and still worth visiting. Outside the cathedral, its spire can be seen from all around. Whether you're up at Old Sarum Castle, driving down one of the many routes into Salisbury, or walking along the street, it's always there, looking overhead, orientating you in the city. As the tallest spire in Europe, it's unmissable and magnificent. The cathedral itself is an impressive and highly-decorated building. Begun in 1220, it took just 38 years to complete, making it one of the most coherent buildings of its type. 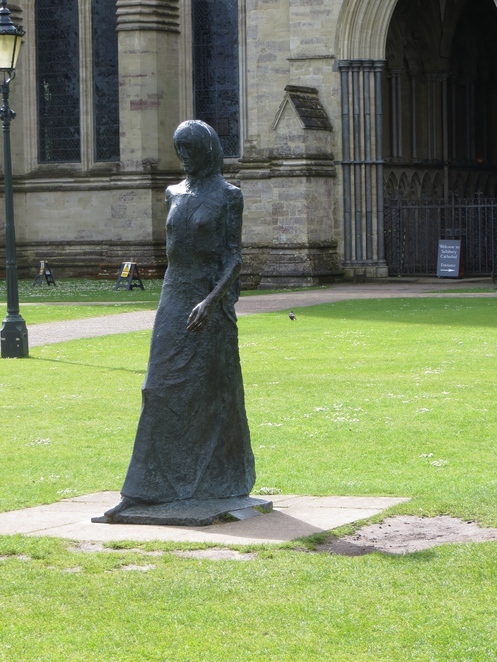 The lawns in the close often feature modern art displays. Inside the cathedral is no less splendid. There are many guides (in green sashes) to show you around if you would like a tour, or you can book onto a guided tour, with groups of 12 at a time being taken up the tower. In the centre is the Salisbury font, a magnificent piece of bronze work created by William Pye, and consecrated by the Archbishop of Canterbury on 28th September 2008. When full it offers a vast mirror in which to marvel at the buttresses above, as well as being an impressive fixture in its own right. The walls are strewn with interesting objects and memorials. Down one side are the old standards of the Wiltshire regiment, a poignant reminder of the area's military history. Plaques further commemorate their sacrifices around the cathedral. 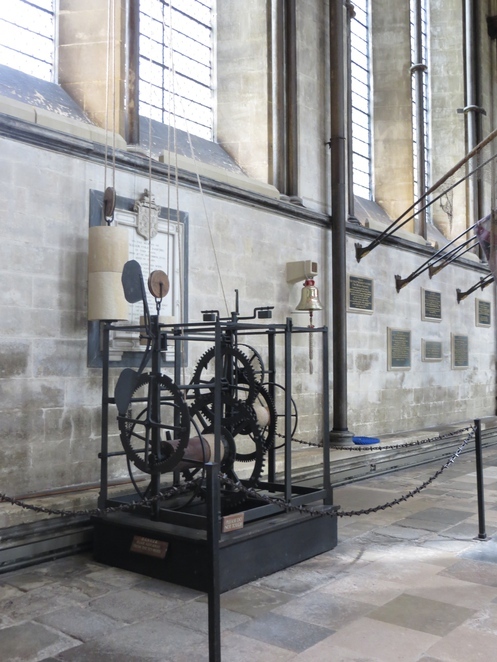 The original cathedral clock is there on show. Perhaps the oldest working clock in the world (supposedly dated 1386), it has no face, but the mechanism is designed to ring a bell (now in the tower) once an hour, so that people in the area had a time reference point. On the hour members of the community come into the pulpit to invite visitors to pray with them. This is a tourist site, but first and foremost it is a working house of prayer, and it's important to remember this. Indeed, as the first cathedral choir to accept female choristers, Salisbury is particularly noteworthy in cathedral choir circles, with an excellent choirschool attached. There are daily services including morning worship, holy communion and evensong. Check the website for times. The cathedral has been so influential throughout time that it even has its own form of worship, the Sarum Rite. 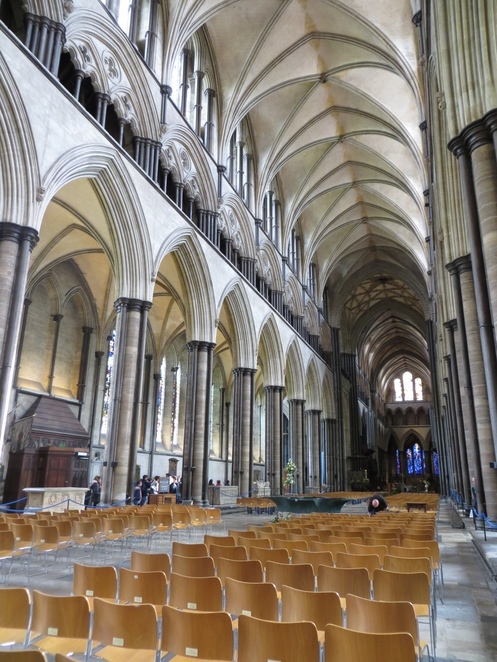 Salisbury Cathedral also contains the best-preserved copy of the Magna Carta. Kept in the chapter house, visitors are requested not to take photographs, and for preservation's sake, it would be appreciated if visitors did take note of this request. Staring at the Gothic script it's impossible to imagine anyone being able to read this document, which has proved so important to English history. The cloisters are a wonderful place for that great British tradition, afternoon tea. The shop sells a fabulous range of teas, served in beautiful glass pots, along with a great assortments of cakes (and most importantly, scones with local clotted cream). Sitting in the cloisters you can reflect on the millennium of occupation and prayer there. This was also the site of one of the earliest hospitals / sanatoriums in the UK. Pilgrims would come in hope of a miraculous cure, which led to a centre for healthcare and healing being set up in conjunction with the cathedral. People came from all over the south of England, such was the draw of this medieval cathedral town. This is a place of healing too. There is parking, at £6 per car, but you're better off walking in. Salisbury is small and the cathedral is easily reached. Do you know if the statue is of someone in particular?